Zaprionus indianus: taxonomic position and species identification. 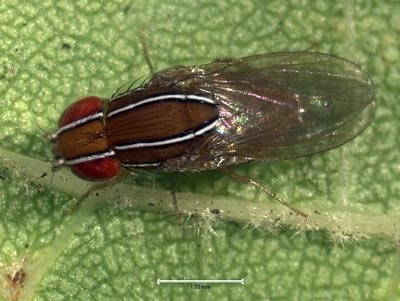 First records of Zaprionus indianus (Diptera, Drosophilidae), a pest species on commercial fruits, from Panama and the United States of America. Zaprionus indianus is assigned to the subgenus Zaprionus, species group armatus and species subgroup vittiger (Chassagnard & Tsacas 1993). I provide here the diagnostic characters of this species and higher taxonomic levels because the published keys (Chassagnard 1988; Chassagnard & Tsacas 1993) are in French. Genus: Most species of the genera Zaprionus (including Z. indianus), Zaropunis and Phorticella have distinctive silvery-white stripes on the top of the head and the thorax. Some species in the subgenus Anaprionus (genus Zaprionus) lack the silvery white stripes and can be confused with other striped drosophilid species. The lobes of the epandrium are truncated in Phorticella but finger-like in Zaprionus, and the anterior orbital bristle is long in Zaprionus but short in Phorticella. Subgenus: Within the genus Zaprionus, the subgenus Zaprionus has an even number of stripes across the thorax, whereas the subgenus Anaprionus has an odd number of stripes. Species group: The species of the armatus group are characterized by anterior femora that have either one large spine on a prominent tubercle (subgroup tuberculatus) or a series of large spines (subgroups vittiger and armatus), whereas the species of the inermis group lack these spines. Species subgroup: The species of the vittiger subgroup, including Z. indianus, have 4 to 6 composite spines, each of which has a second short branch at its base. These spines function as a rest for the tibia when the leg is folded. Species: Within the vittiger subgroup, Z. indianus is identified by its overall yellowish (not brown) thorax and abdomen, and by the narrow (relative to those of the other species) silver bands bordered by black bands across the head, thorax and scutellum. The black bands do not widen on the scutellum, and the scutellum is without a white tip. The composite spines are not located on small tubercles as in some other species within the subgroup. The basal part of the "collerette" (Chassagnard 1988), a structure surrounding the gonopore of the distiphallus, is not serrated and ends into a point which lies on the distiphallus surface (other species have different serration, often round ends not touching the distiphallus surface). Special thanks go to Stephane Prigent for his insightful comments. Chassagnard, M. T. 1988. Esquisse phylogénétique du genre Zaprionus Coq. (Diptera: Drosophilidae) et description de trois nouvelles espèces afrotropicales (in French). Le Naturaliste Canadien 115: 305-322. Chassagnard, M. T., and L. Tsacas. 1993. Le sous-genre Zaprionus S.Str. : définition de groupes d'espèces et révision du sous-groupe vittiger (Diptera: Drosophilidae) (in French). Ann. Soc. Entomol. France (N.S.) 29: 173-194.